We love hiking. Most of our summer trips are planned around where we can find good hiking trails and, thankfully, Newfoundland has a lot of them. Last week we went to Fogo Island (a small island off Newfoundland's coast) and spent pretty much our whole time there on beautiful trails with the ocean all around us. It was, in my opinion, a perfect way to spend a few days. On one of the hikes, we were going up a hill on loose rock. The trail was hard to see at times because it was on the rocks, and we'd have to look ahead to where it went through a patch of grass to make sure we were staying on course. At one point, Aiden was at the front of the line and I was following him, head down, concentrating on where I put my feet so I wouldn't slip. I thought, "I sure hope Aiden can see the trail, because I'm just following him wherever he goes!" That thought immediately made me think of sheep, and suddenly I had a line from Handel's Messiah stuck in my head: "All we, like sheep." (Go listen a second and then come back. That's exactly what I was hearing!) That line, of course, is taken from the verse, "We all, like sheep, have gone astray, each of us has turned to our own way; and the Lord has laid on him the iniquity of us all" (Isaiah 53:6). Sheep are hardwired to follow the sheep ahead of them. Mostly, that's a good thing because it keeps the sheep together, not wandering off in a hundred different directions and getting lost. But that's not such a good thing when the lead sheep has lost the path. We humans are definitely like sheep. We follow trends and fads. We dress like the people around us and generally try not to be so different that we stand out from the crowd. Most of the time, this is not a problem. But what about when the culture around us is trending towards treating others with disrespect? Or when the people around us are always trying to see how much they can get away with without getting caught? Do we start to follow without even really being aware of it? In John 10:11-18, Jesus called Himself 'the good shepherd,' which says so much about our relationship to Him. The shepherd is the protector of the sheep and, most importantly for this devotion, the sheep know and follow the shepherd. Wherever that shepherd goes, the sheep will follow. Of course, the shepherd doesn't just lead the sheep about willy-nilly. He has a path he's following to take the sheep somewhere, whether it's to good pasture or a safe place to rest or to clean water. Likewise, Jesus has a path He's leading us on and it leads to good places. Following Aiden on the trail, I couldn't see the path ahead of me, so I had to trust that he could. When it comes to our lives, we often can't see the path ahead either. And since we have much the same basic nature as a sheep, it's likely we'll end up following someone at least some of the time. The question is, are we following Someone who can see the path, or are we just blindly following another sheep who is following another sheep, following another sheep...? PS. While researching sheep and their tendency to follow, I stumbled upon a fabulous story of sheep invading a Spanish town because their shepherd fell asleep. Paul and I have signed up for our first 10K race, which will take place in a couple of weeks. Looking at the finish times from the race last year, I'm thinking it's quite likely I'll come in dead last. The slowest time last year was a full 6 minutes faster than the fastest I've ever run 10K! Obviously, the pool of runners will be different, so there may be someone even slower than I am, but even if I am last, I'm not worried about it. I'm not actually racing to win. I'm running the race against myself, trying to improve my fastest time and I'm planning to enjoy the race atmosphere. Besides, someone has to be last! Running races have become a big thing. There are thousands of races every year, from 1 mile races, to 5 and 10K races, half marathons, marathons and ultramarathons. The funny thing is, very few of the people running the races are actually running to win first place. Most people are just like me, running against themselves, against their previous fastest times or against the voice in their head that says they can't do it or against the memory of races that didn't go well. Or maybe they're just racing for the fun of it. Galatians 2:1, 2 - "Then after fourteen years, I went up again to Jerusalem, this time with Barnabas. I took Titus along also. I went in response to a revelation and, meeting privately with those esteemed as leaders, I presented to them the gospel that I preach among the Gentiles. I wanted to be sure I was not running and had not been running my race in vain." Paul wanted verify that he wasn't doing something wrong, that he had been teaching what was right and true, not wasting his time and effort and causing harm by teaching falsely. Acts 20:24 - "However, I consider my life worth nothing to me; my only aim is to finish the race and complete the task the Lord Jesus has given me—the task of testifying to the good news of God’s grace." Paul was focused on what God wanted him to be doing. Galatians 5:7 - "You were running a good race. Who cut in on you to keep you from obeying the truth?" The Galatians were being led astray by false teachers, people who were trying to tell them that believing in Jesus was not enough for salvation and there were other conditions that needed to be met as well. Paul equated that with losing the way and veering off course during a race. 2 Timothy 4:6, 7 - "For I am already being poured out like a drink offering, and the time for my departure is near. I have fought the good fight, I have finished the race, I have kept the faith." Feeling that his death was approaching, Paul could look back and see that he had done what God wanted him to do. And one from an unidentified writer, Hebrews 12: 1, 2 - "Therefore, since we are surrounded by such a great cloud of witnesses, let us throw off everything that hinders and the sin that so easily entangles. And let us run with perseverance the race marked out for us, fixing our eyes on Jesus, the pioneer and perfecter of faith." I love that this writer encourages us to run with perseverance in this verse. There's no doubt that running can be hard, especially long distance running. Life can be hard too, but by staying focused on God rather than on our circumstances, we can continue running the race God has for each of us. I find it interesting that Paul and the writer of Hebrews talk about "my race" and "the race marked out for us." Not everyone had been called to travel as a missionary and plant churches like Paul had been. Each of us has a different race to run, and it's no good for me to try to run your race or for you to try to run mine. It's no good for me and Paul to run together. He's much too fast for me...if I try to keep up with him I'm going to run out of steam long before the race is over. And if he tries to run at my pace, he won't finish nearly as well as if he runs at his normal pace. It's no different for us spiritually speaking. He's a high school teacher and the kids often talk to him about difficult situations at home. Though he doesn't tell me their stories, he does occasionally say something like "The things some kids deal with at home is enough to turn your stomach." I wouldn't be able to listen to the kids and help them, because I know I'd never be able to deal with their pain. Paul can, though. That's his ministry to those kids who need someone who will listen. It's his race and there's no way I could run it. We're all living this Christian life together, but at the same time we're all running our own races, the ones God has marked out specifically for us. 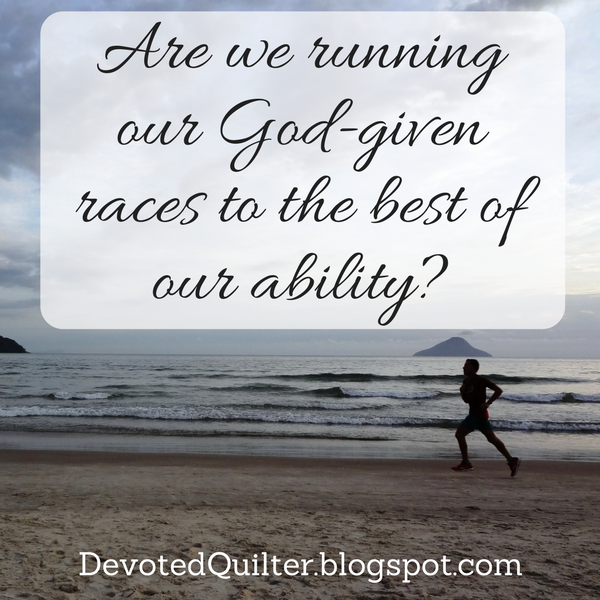 The question we have to ask ourselves is: Are we focused on running our God-given race to the best of our ability? Welcome to my stop on the 12 Days of Christmas in July blog hop, hosted by Sarah of Confessions of a Fabric Addict! Sarah has put a lot of work into this hop, including a quilt-a-long on her blog and even a giveaway every day, so be sure to head over there to get in on all the good stuff. 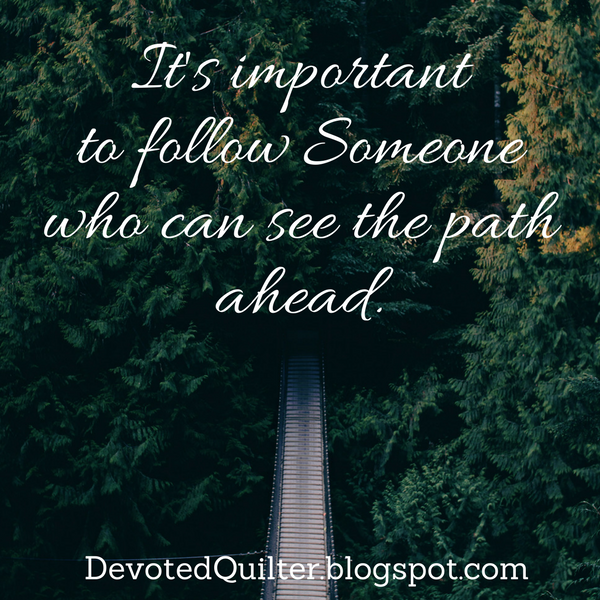 If this is your first time here at Devoted Quilter, it's great to have you. If you like what you see, be sure to sign up for my newsletter, The Bulletin. When you do, you'll get my free Wind Farm quilt pattern (exclusive to subscribers) along with a fun monthly email from me. I've been planning the ornaments I wanted to make for this hop for months, though I only finally got to make them a couple of days ago (on the hottest day we've had yet, no less!). In fact, I had hoped to use this hop as the perfect opportunity to get all the ornaments I plan to give out for Christmas made well in advance. Instead, I've made...three. 😒 But at least I'm three ahead, right? I used the same basic method as I used last fall for my Free Motion Quilted Ornaments, but this time around I made them smaller and tried something different with the quilting. 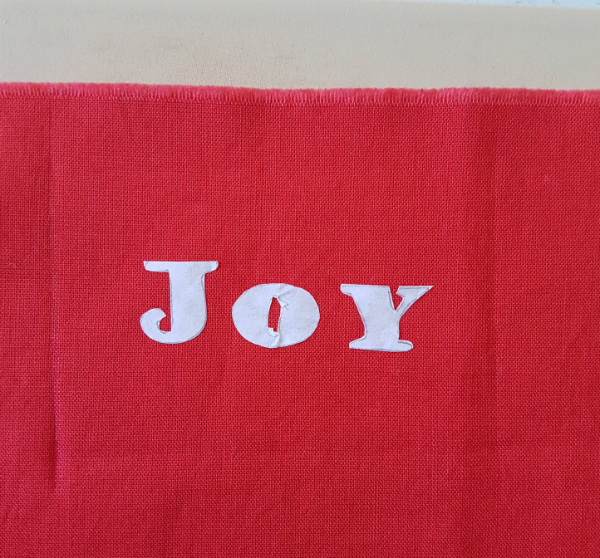 I started by printing out the word JOY and tracing the letters onto freezer paper. They look deceptively large in this close-up, lol. Then I cut the letters out and used my iron to stick them to a piece of solid red fabric. I used my Hera marker to trace around a credit card to give me the outline of the ornament. Then I layered with batting and backing, added the ribbon and started quilting 😊 Don't you love when you can get to the quilting stage so quickly? 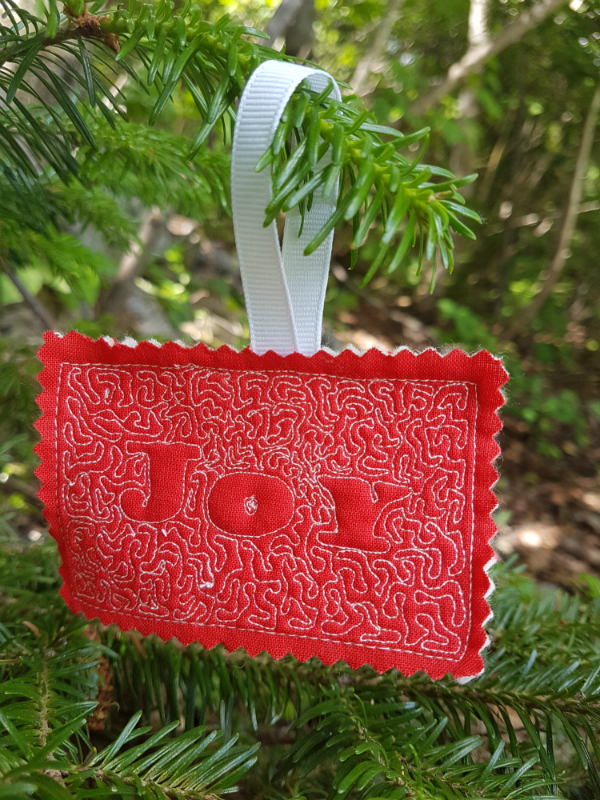 I outlined the outer edge of the ornament first, then micro stippled my way in to the J. I outlined the letters and filled in the rest with more micro stippling. I love how it looks! I really like the way the letters pop against the micro stippling. 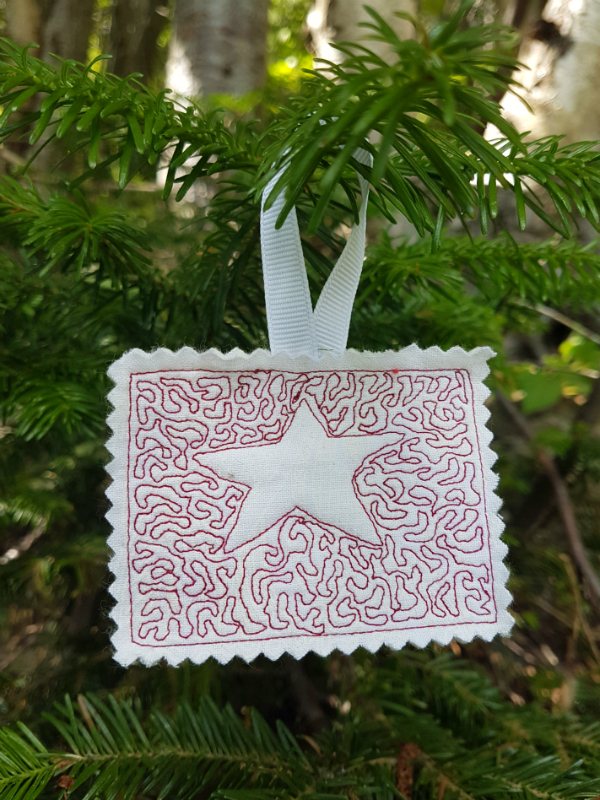 And I love the classic look of the red and white, especially against the green of the tree. I have to admit, though, the freezer paper wasn't great for the letters. I'm guessing it's because the letters were so small that as I stitched around them they were lifting off the fabric. I'll have to think about other options for transferring the letters to the fabric. Maybe just tracing with a disappearing marker would work. Do you have a favourite disappearing marker? The freezer paper worked better for my other two designs, both of which were bigger than the letters. First up, a heart. I switched to white fabric and red thread for this one. I like it, but I definitely want to try one on red fabric with the white thread. And then a star. I want to make more of these on yellow fabric, but I haven't decided what colour thread I'd want to use. I don't know if white would have enough contrast. I'll probably have to give it a try to find out. I didn't make the stippling as small on these two and I think they'd look better with smaller quilting. My stippling tends to be a bit messy, but it's less noticeable when there's more of it, lol. Something to keep in mind when I get around to making the rest of the ornaments for Christmas. If you'd like to try your hand at free motion quilted ornaments, be sure to check out my original tutorial for all the how-to. And if you'd like to see more projects like this, don't forget to sign up for The Bulletin. Head over to visit Sarah for the quilt-a-long and info on the giveaway. Plus be sure to visit the other bloggers sharing today. Thanks for stopping by and Merry Christmas in July! When I am trying to find a fabric to suit my quilt, I am limited to what I can find either in a local store or an online retailer. I may have to settle for something that isn't exactly what I had hoped to find. But when God created us, He was not limited in any way. He never has to settle, making do with a talent that isn't quite right. 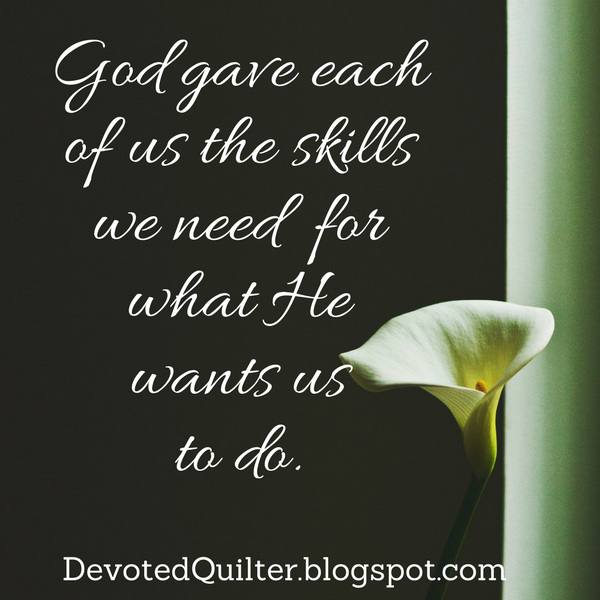 To each one of us, He gives the exact skills and abilities we need for the role He would have us fill. This doesn't mean we never have to work at improving our skills. Even when given the ability to play piano, a musician must practice and work hard to hone that craft. It's the same for other talents God has given us. Christmas in July Blog Hop Begins! 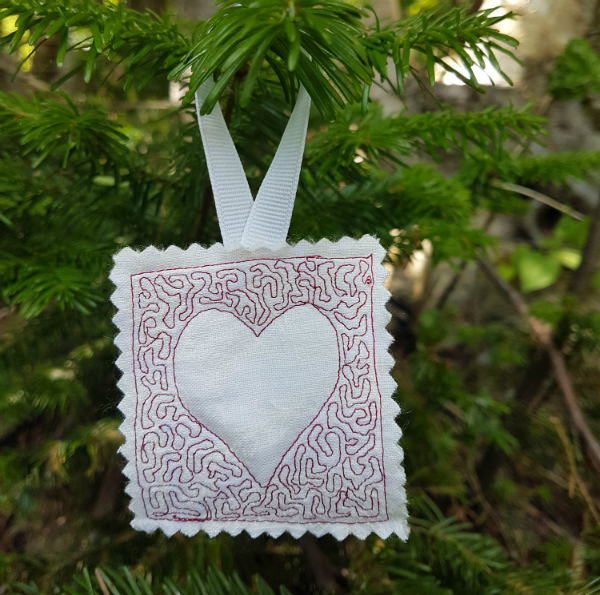 I'm just popping in to let you know there's a blog hop starting today - 12 Days of Christmas in July, hosted by Sarah at Confessions of a Fabric Addict. There will be bloggers sharing great Christmas ideas every day, plus Sarah is hosting a quilt-a-long AND there's a giveaway EVERY DAY! I'll be sharing my project next weekend, but in the meantime, pop on over to Sarah's blog to check it all out! 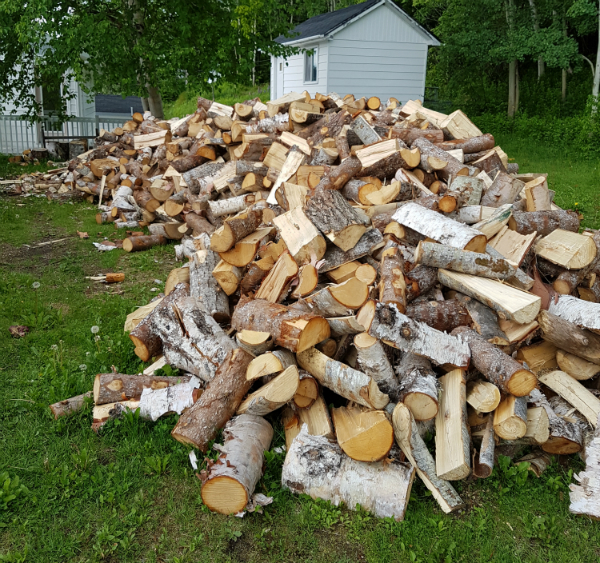 We've had our firewood for next winter delivered, which means our backyard looks like this. Every year when the big truck comes and I'm left staring at that huge pile of wood, all I can think is, "I have wood, anyone have sheep to trade?" That only makes sense to you if you've played Settlers of Catan...otherwise you probably think I'm crazy 😊 In the game you're trying to build roads, settlements and cities, all of which require certain combinations of resources (cards that you pick up as the game goes along). Players are allowed to trade resources, which is great because sometimes you have an abundance of wood and no sheep so you can't build that settlement you've been eyeing, and trading can help make it happen. Of course, humans have been trading things forever. Payment "in kind" used to be a common thing, meaning you could pay with the vegetables from your garden or the eggs from your chickens or whatever else you had. Even today we are really just trading our money for the things we want to buy. When you're considering a trade (in a game or with your money), you have to look at what you're giving up and what you'll be getting in return. Then you decide if the trade is worth it to you. We've all said something like, "I'm not paying that much for that!" or "I'd love to have it, but I just can't see spending that much money on it." On the other hand, we've also all said, "It was such a good deal, I just couldn't pass it up!" What you may never have considered is that God made a trade for us. "For God so loved the world that he gave his one and only Son, that whoever believes in him shall not perish but have eternal life" (John 3:16). This is probably one of the most well-known verses in the Bible and for good reason. It sums up salvation perfectly. God so loved the world...this is what God was going to get in return for this trade. Not the physical world, but the population of the world. God loved (and still loves) the people He created so much that He was willing to trade Jesus in order to provide a way for our salvation. that he gave his one and only Son...just think about the cost of salvation for a moment. Jesus gave up being in heaven and came to earth as a human being, making Himself subject to emotional hurts and physical pain. Think about how much of both He endured as He paid the price for our salvation. that whoever believes in him shall not perish but have eternal life. We had no part in making the trade, but we definitely benefit from it. Whoever believes really means that anyone is welcome to benefit from the trade that God made for us. As soon as you believe that Jesus came to earth and died for your sins, you receive the eternal life that God gives to everyone who believes. The amazing thing about this is that God considered it all beforehand. He knew what would happen while Jesus was on earth. He knew the cost of the trade. And He knew what He would get in exchange for the trade (us!). Knowing all of that, He considered what He got in return to be worth what He gave up. 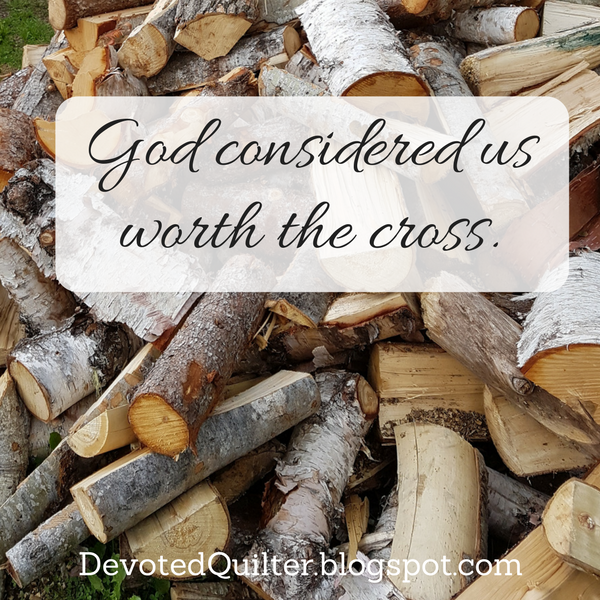 We were worth the cross. Aren't you glad He made the trade for us? Do you read the book of Proverbs? I think it was Chuck Swindoll, of Insight for Living Ministries, who said he once knew a man who read through Proverbs every month, reading the chapter that corresponded with the day of the month. For a while I did that and, though I'm not doing it now, I do sometimes read the day's chapter in Proverbs before any other Bible reading. It's amazing how many nuggets of truth are packed into those 31 short chapters. Consider this, for example: "Those who work their land will have abundant food, but those who chase fantasies will have their fill of poverty" (Proverbs 28:19). When I read this verse last week I just stopped and thought about it for a while. Most of us aren't working the land to produce the food we eat, but the same principle still applies. Doing the work = food on the table. Lazing around and thinking about doing the work someday = no food. Simple enough, right? For some reason, though, I couldn't get the verse out of my head, mostly the 'those who chase fantasies' part. I have to admit, I don't often daydream about going grocery shopping, or having firewood to heat our house, or buying clothes for the boys or any of the other necessary things our jobs provide the money for. If we didn't have the money for those things, I probably would daydream about them, but we definitely know the work = food formula and the income from our jobs keeps us comfortably fed, clothed and warm through the winter. I hope the same is true for you. But there are things I daydream about. 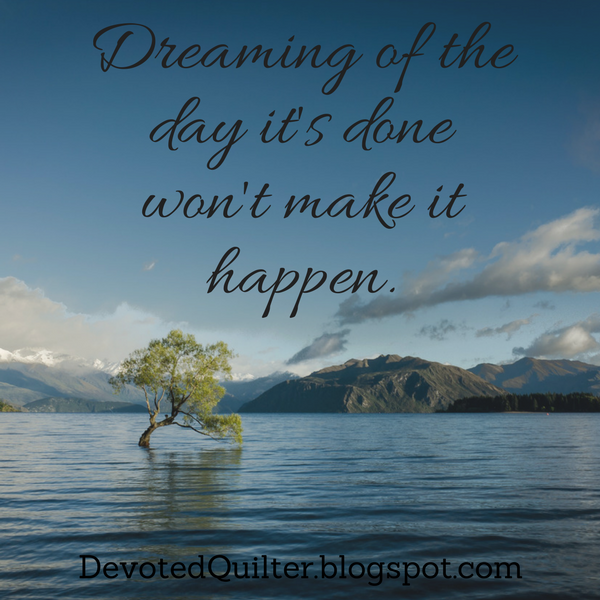 Things like turning my quilt design business into my full-time job, having a more consistent Bible reading schedule, going to QuiltCon someday, writing a book of devotions, a big vegetable garden...I could go on and on (I've always liked to daydream 😉). You probably have things you daydream about too. Maybe your dreams include a better relationship with a family member, or a bigger house, or a smaller waistline. It doesn't matter if we dream about big things or little things, either way, those dreams won't come true unless we do the work. Whether we want to lose 10 pounds or write a book, dreaming of the day it's done won't make it happen. If it did there wouldn't be an obesity crisis and I'd be the author of about 1000 books by now. Unfortunately, it's a lot easier to dream than it is to actually do the work. But this verse in Proverbs reminds us that unless we do the work, we'll have our fill of poverty. Sure, it may not be financial poverty, but what about relationship poverty or health poverty or even just dream-fulfillment poverty? It's time for us to stop just dreaming and start putting some work behind those dreams!